American DJ Event Bar Q4 DJParts - All Variety of Parts that DJ Needs. Create pure lighting excitement full of colorful beams of light with the ADJ Event Bar Q4. This fixture is powered by four 10W CREE Quad Color RGBW (4-IN1) LEDs. This 4-head Pinspot system produces small 5-degree beams from exciting built-in programs. User may also program the beam’s colors and movements with a DMX controller (sold separately). The Event Bar Q4 is a versatile fixture that may be used to spot tables, décor and retail environments, or used as a special effect light at night clubs or other parties. The Event Bar Q4’s base has built-in DMX-512 In/Out, IEC power In/Out connectors, a 4-Button DMX LED display, built-in microphone for sound activation and ¼-inch input for ADJ easy-to-use UC3 controller (sold separately). 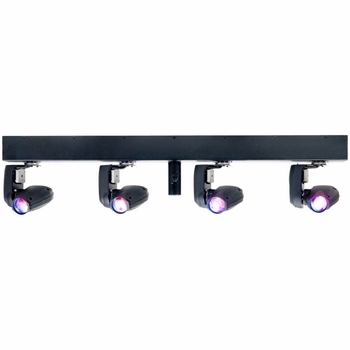 Specifications: • Four Head X-Y Bar Pinspot system with 4x 10W CREE Quad Color RGBW (4-IN-1) LEDs • Each Pinspot’s colors and movements may be individual controlled via DMX • 3 DMX Channel Modes: 1, 12, or 14 channels (Rev. 2/14) 4 DMX Channel Modes: 2, 32, 33 or 37 channels • 4 operational modes: Auto (Show Run), Sound Active, RGBW Dimmer and DMX-512 Mode • Flicker Free • 4-Button DMX LCD Display • 12 Built-in Shows • Electronic Dimming: 0 - 100% • Full Dimming /Strobing on each Pinspot head • Beam angle: 5-degree • Linkable: DMX via 3-pin XLR cable; Power via IEC daisy-chain power link (Up to 6 Event Bar Q4’s @ 120V, up to 10 Event Bar Q4’s @ 230V) • Compatible with American DJ UC3 Series easy-to-use controllers (sold Separately) • Long Life LEDs (Rated at approximately 50,000 hrs.) • Light Source: 4 x 10W Quad (RGBW: 4-IN-1) LED • Omega bracket included so the bar may be attached to a clamp for truss mounting • Built-in mount for a lighting stand (stand sold separately) • Safety loop on rear • Power Consumption: 56W • Multi-voltage Operation: AC 100 - 240V, 50/60Hz • Dimensions (LxWxH): 41” x 4.25” x 10.75” / 1040 x 103 x 270mm • Weight: 29 lbs. / 13 kg.